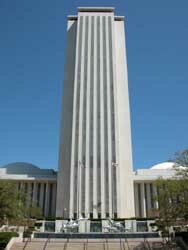 The current Florida capitol building is a 22-story tower built in the 1970s. It is the center of the new capitol complex that spreads out symmetrically on both its sides. Directly in front is the old capitol, which has been restored to its 1902 appearance and now houses a museum. 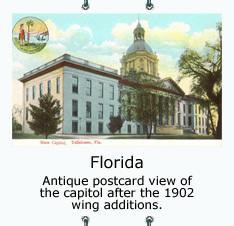 The capitol is most often pictured with the old capitol in front, but when photographed from the other side, the old capitol might not appear at all. 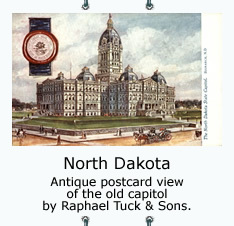 The association for the Florida and North Dakota capitol towers is written at the bottom of this page, after the North Dakota section. Since they are both relatively simple towers, I didn't find unique features for two separate associations, so it was necessary to combine them to avoid confusion. The tower of the Louisiana capitol is tapered in several stages starting at the 22nd floor. At the very top is a cupola, or lantern, which is the more appropriate term in this case since it contains a light and acts very much like a lantern at night. The building's shape with the lantern on top is like a tall, tapered candle. Candles are used frequently in the USA, most notably at parties. A dinner party especially would include candles tapered much like this capitol is. What is probably the biggest party this country regularly holds? Mardis Gras in New Orleans, Louisiana, of course. 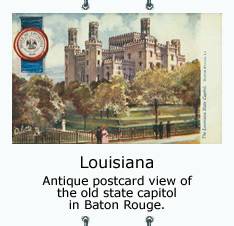 (Keep in mind the capital of Louisiana is Baton Rouge.) So: candle, party, Mardis Gras, Louisiana. This association for identifying the Louisiana capitol through New Orleans' Mardis Gras was planned since early in 2004. Now that I am adding it to my site in September of 2005, it is with great sadness and many prayers that New Orleans will rebound from the destruction of Katrina and the following flood, and again be the gracious host of the greatest party in the nation. Adding a happy note in 2006; Mardis Gras went on despite Katrina's aftermath. You just can't keep a great city down! Another note in 2013; the Super Bowl is back in New Orleans. 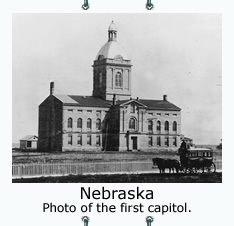 The Nebraska capitol is our oldest tower capitol, and our only tower capitol with a dome on top. Like the others, the building spreads out at the base of the tower, but instead of spreading mostly to either side, this one forms a square all around the tower. There is a great arial image that shows the base on Favorites, Footprints. 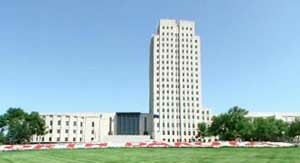 Compared to tapered Louisiana and flat-topped Florida and North Dakota, Nebraska's domed capitol tower can easily be seen as resembling a tall, slender man. Possibly the most famous tall and slender man in American History is Abraham Lincoln, the 16th President of the United States. He described himself: "If any personal description of me is thought desirable, it may be said, I am, in height, six feet, four inches, nearly; lean in flesh, weighing on an average one hundred and eighty pounds . . ." Six-foot four, 180 pounds. Lincoln was born in 1809. He was indeed a tall and slender man for the time, and would have still been one now, 200 years after his birth. 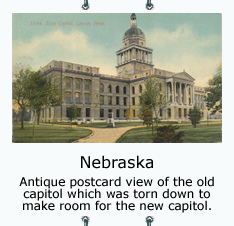 Since Nebraska's capitol building is in the capital city of Lincoln, Nebraska, this association is simple. 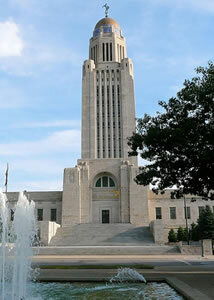 The capitol that looks like a tall, slender man is in Lincoln (a very famous tall, slender American man), Nebraska. 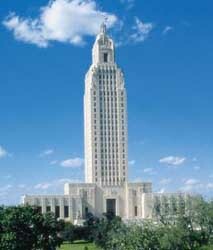 This capitol is certainly surprising for a plains state with lots of wide open space and no really big cities. Who would expect a tower there? In North Dakota, they refer to their tower as "The Skyscraper on the Prairie." It is the tallest building in the state. 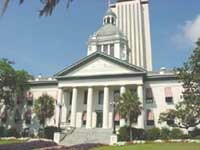 Very often, pictures of this capitol only include the tower and not the sections to the left of it as shown here. There is also a large addition to the right of the tower now, but it hardly shows from behind the trees. Another thing that makes this capitol unusual is the lack of ornamentation. Anything unnecessary from the original plan was omitted because it was built during the depression and there simply weren't funds. 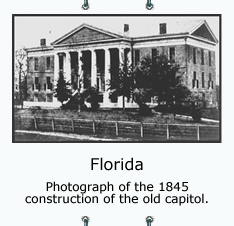 The previous capitol had been destroyed by fire, and the new capitol had to be built in hard times. The original plans had included ornamentation. Some pains were taken to be sure the planned sculptures could be added later with minimal work and cost, but that hasn't happened. Since their capitols are both relatively simple towers, I didn't find unique features for two separate associations. It was necessary to combine them and get a little bizarre besides. Here's an interesting fact: Rugby, North Dakota is the geographical center of North America. That means if the continent were a flat plate of the same thickness and density all over, it could balance on Rugby, North Dakota, its center of gravity. They have erected a monument, a cairn, to mark the spot. Let's get imaginative and make this even more interesting and memorable, shall we? What if a giant plate-spinning juggler in a giant circus was spinning the flat continent on a pole? Now there's an image! Whoa! Picture Rugby hardly moving, the cairn just rotating in place while the rest of the continent is whizzing around! People are getting thrown out and away from the center by centrifugal force; we have to build walls at our borders to keep our citizens from being thrown into Canada and Mexico and off the edges. Where do they all end up? They stop first at a border wall, but from there they all flow to the place that is farthest from the center of the spin but still inside our walls, and that is the southern tip of Florida. We can't just leave everyone in Florida! We need to redistribute all these folks, to get them out of Florida and back home, wherever it is. The easiest plan is to get them all to North Dakota and let them flow back toward their homes from there, take advantage of the energy from the spin. We need a transportation system based on cables so all passenger compartments are safely attached to the spinning ground. An above-ground cable car system like a closed-car ski lift would be perfect; a sturdy, solid, cable car line suspended from towers from Florida to North Dakota. To anchor our cable system, at each end we need a really tall, solid tower, a post-like structure. About 20 floors of height should do it, and some good width for strength. Guess what? 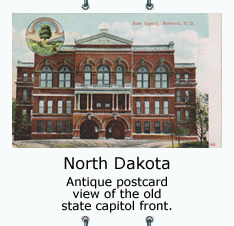 The capitol buildings of Florida and North Dakota are just right for the job! Solid skyscrapers, 22 and 19 floors respectively, shaped rather like posts, and built for public use. The capital of North Dakota is Bismarck, not Rugby, and the capital of Florida, Tallahassee, is in northern Florida, not on the southern tip. There is a simple way to tell which tower is which. The North Dakota tower has a vertical center line that can be imagined as dividing the building into two parts, just like the state's name is two words, while Florida's capitol is definitely one solid piece, as is Florida's name.